This is a unique list of 15 fat burning foods - some perhaps you've never heard of! Some have the capacity for improving your cell health and metabolism significantly. Not all of these are widely known to burn fat, especially the first one you see here. It can make a remarkable difference for someone's health and weight management. People with excess fat have excess inflammation. Nettles will reduce your inflammation. These are all thermogenic foods that will provide you with hard to get nutrients and help you burn fat too. Add these foods to your low glycemic eating plan along with plenty of fresh fruits and vegetables. Start every day with a cup of nettle infusion which will give you wonderful energy because it's full of vitamins and minerals! It's very hard to get enough minerals in the foods we eat. Of these 15 fat burning foods, nettle infusion is the most significant game changer. Don't worry, it tastes like strong tea. 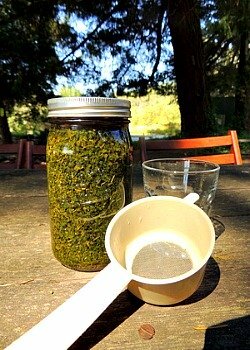 Buy stinging nettle as a dry herb at your natural foods store and measure one cup into a quart jar. Cover with boiling water and let it steep overnight. It will last for 2 - 3 days in the refrigerator. Just strain a cup or two each day and replenish with boiling water. I found a cup size strainer just for this purpose at a kitchenware store. It's very important to get your calcium from food so your body can absorb it. Stinging nettle infusion will help significantly with calcium intake and in restoring insulin sensitivity. 2) Salmon is the king of this list of 15 fat burning foods. It is full of omega 3 fatty acids that promote burning of fats by helping to move fatty acids into cells where they can be burned as fuel. Buy wild salmon not farm raised. Read more about how marine foods burn fat here. 3) Green tea is a beverage the Chinese have recognized for it's health benefits for centuries. It increases metabolism without giving you the jitters and is one of the key 15 fat burning foods. It will assist you in burning calories and lowers the production of fatty acids. It can help to inhibit fat accumulation in cells. 4) Coconut oil - Virgin coconut oil shifts your metabolism up because it contains medium chain fatty acids. *3 It can help you burn body fat so long as you do not consume more calories than you need and you are getting just 30 grams of fat a day. A tablespoon of coconut oil is 14 grams and it can be added to a hot beverage. The thermogenic effects of coconut oil (MCFA) last up to 24 hours! *4 That means your energy is sustained all day. 5) flaxseed meal - Flaxseeds are the richest source of alpha- linoleic acid, an omega 3 fatty acid that helps you to stay regulated, eliminate waste and that promotes fat burning for you. Essential fatty acids increase metabolic rate, oxidation rate and energy production. Flaxseeds are in the top 15 fat burning foods. 7) flaxseed oil - This is the most concentrated way to get the fat burning benefits of flaxseeds. If you want to accelerate your fat burning you may want to consider adding some flaxseed oil to your eating plan. This could have significant, positive impact for someone who has been heavy a long time. If you think you are deficient in omega 3 fatty acids this is an important strategy for you. Just be sure you cut way back on your saturated fats. You only need about 30 grams of fat a day. 8) tuna - Another marine food that, like salmon, contains omega 3 fatty acids that promote fat burning. According to one study,*5 marine foods stimulate the secretion of leptin, the hormone that decreases appetite and promotes the burning of body fat. Summer is a great time for making a salad a meal and adding tuna makes it a fat burning dish. 9) walnuts - Walnuts have more antioxidants than any other nuts and are one of the few sources of plant based fatty acids (alpha-linolenic acid) along with flaxseeds. They promote efficient burning of fat and provide lots of nutrients that support your brain. Walnuts are perfect for your low glycemic/fat burning eating plan. 10) yogurt - A good quality yogurt provides you with calcium and protein that help you to burn fat efficiently. You can get 35 - 40% of your daily value of calcium from a cup of good quality yogurt. Several studies have shown that weight gain occurs when calcium levels are low. 11) chile peppers - Turn up the heat in your meals! There is a fiery hot compound in chile peppers called capsaicin. This is a thermogenic (fat burning) spice that "heats you up." It requires energy to eat chile peppers! Add them chopped in tacos, Asian dishes, salsas, omelets and stews for extra flavor and to burn more fat. They also suppress your appetite and help you to eat less! These definitely belong on a list of the top 15 fat burning foods. If you can find Thai chile peppers in an Asian market they are less intense but just as hot and I think have more flavor than the chile peppers we are used to in Mexican cooking. 12) cold potato salad - When potatoes are eaten cold they become "resistant starch" and have a low glycemic index because they require slower, longer digesting. You can burn more fat eating the foods that stay in your colon longer. Resistant starch supports the growth of friendly bacteria in your colon. Read more about resistant starch and get a recipe for a healthy potato salad. When they are cold, potatoes become one of the 15 fat burning foods. 13) cold pasta - Pasta is already low glycemic and when you eat a cold pasta salad you get resistant starch AND more efficient fat burning. Eating a cold pasta salad is an excellent way to support you in losing fat. You need to be sure that the salad dressing you add to it is conducive to losing weight. 14) cold rice rolls - White rice is high glycemic but chilled it becomes resistant starch and doesn't break down in your small intestine but passes on to your colon where it has many health benefits including that it helps you burn fat. Look for the rice rolls with avocado and eel or salmon which contain omega 3 fatty acids and you have even more fat burning power! Making rice rolls is an art and not one you are likely to have time to learn but you can buy rice rolls in many Japanese take out restaurants. 15) cold lentils - This high fiber food is even more of a power house for weight loss when you chill it. When lentils are cold they've got resistant starch. Resistant starch helps you burn more fat, keeps you fuller longer and prevents you from storing fat. Lentils make an interesting cold salad and mix well with vegetables, sprouts and even some tuna! 15) Whey belongs on the list of 15 fat burning foods but not just any whey. The best whey product for fat burning is a protein powder that uses an advanced, patented, peptide technology that targets fat and helps you to burn it off. The one I recommend has a concentration of specific fat burning peptides in a powdered form that you can add to a meal replacement shake. It's a great source of bio-available calcium and contains 15 grams of protein in one serving. When you replace your evening meal with a smoothie with this whey powder you are going to accelerate your fat loss in a big way. Take this list of 15 fat burning foods and decide which you can add to your daily eating plan to get skinnier! They are a power house of nutrients specific for good weight management. Be sure to watch your portions and cut back on saturated fats. Start your day with a cup of nettle infusion and then have your tea or coffee with breakfast. Substitute one meal with a hefty summer smoothie for faster results. Walnuts make great low glycemic snacks with whatever fruit you have growing in your area. Flaxseed meal can go on top of your Greek yogurt with fresh summer fruit. Potato or pasta salads make great mid-day meals with a raw vegetable salad. You are getting a powerhouse of nutrients and the fat burning properties with this list of the best 15 fat burning foods. What could be better? For more food nutrition facts that impact your weight management, please see the list of articles below! 2. Nat Med. 2006 April;12(4):425-32. 3. Baba, N. 1982. Enhanced thermogenesis and diminished deposition of fat in response to overfeeding with diet containing medium chain triglyceride. Am. J. Clin. Nutr. 35:678. 4. Bulloo, A.G., et.al. 1996. Twenty four hour energy expenditure...low to moderate amounts of medium-chain triglycerides...Eur.J. Clin. Nutr. 50(30):152-158. 5. Department of Nutritional Physiology, University of S. Australia, Adelaide, March 2005. Return from 15 Fat Burning Foods back to Food Nutrition Facts. Return from 15 Fat Burning Foods to Lifetime Fat Loss home page.